No flashy new features or buzzwords, just magnificent racing stemming from a refinement of Grid 1s greatness. Ordinarily it's hard to feel sympathy for games marketing folks. They use portmanteaus like RealFeel or TrueDrive when they mean handling, and talk about that sweet spot between arcade and simulation like it's a slider on the dev's toolset that no-one thought to include before. But you have to feel for whoever was in charge of penning Grid Autosport's back-of-box brags; it's a fantastic game, but its strengths lie in perfectly nailed fundamentals rather than new features. Er, the racing feels really, really real? No dice. Back to the drawing board, marketing person. Of course, I feel for them particularly because now I have to explain its mercurial qualities too. Grid Autosport succeeds because it doesn't over-stretch itself. There's no expanded management element here, nor any new curios like Grid 2's dynamically changing track layouts. 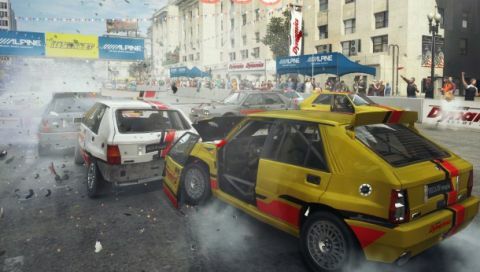 Instead, Codemasters focuses on improving the series' already impressive AI, delivering a firm and fun handling model and setting it to task in five key disciplines: Touring Cars, Endurance, Open Wheel, Tuner and Street. Compete for teams in these disciplines to fulfil sponsor objectives and earn XP, then unlock more events in faster cars. Simplicity itself. Perhaps the best thing Grid Autosport does is place you more often than not in the middle of the pack. There probably is some rubber-banding at work (a term our friend in games marketing no doubt hates, and would rather see replaced by PackSense or some such), but it's much subtler than any of Autosport's contemporaries. You're used to having slightly better acceleration than the AI in racing games (spoilers: that's why you always win) but here, you don't. You have better brakes . That means in order to take a place, you need to line up an opponent, anticipate his braking point, then either brake slightly later or pick a wider line and brake earlier, hoping to carry more speed out of the apex. In either event, they usually repass you. Suddenly, 5th place becomes a towering achievement. Trying to fulfil a sponsor objective that demands you drive a clean race and still bag the podium necessary to win the championship becomes the single hardest and most rewarding thing you've recently done in a racing game. It's excellent. It's great to see Touring events return to the series. They're elbows-out affairs that the AI seems to enjoy as much as you. Where most racers give you a procession of Sunday drivers obsessed with each other's rear bumpers, Grid Autosport provides a ferocious rabble, always just one braking zone away from a five-car pile-up. Opponent behaviour is impressive across all race types, but it's most keenly witnessed in this weapons-free discipline. They, like you, have other considerations during Open Wheel and Endurance events. Lightweight formula vehicles are remarkably allergic to high-speed impacts as it turns out, so AI aggression is muted here for obvious reasons. Conversely, Endurance cars can take more of a battering, but everyone's trying to keep their tyres fresh in these night-time runs and so drive much more conservatively (it's a lot more fun than it sounds, this). Tuner and Street event types are a bit less engaging, if only because they revert back into what Grid Autosport's largely departing from—that homogenised muscle car bombast we all got bored of five Need For Speeds ago. Plaudits are due for the edge-of-your-seat drift handling, but broadly it's these tuners and street circuits that made Grid 2 feel a bit of a sell-out. Well, that and the cut-scenes of social media numbers skyrocketing after your every victory. Handling isn't a revelation—Autosport neither attempts nor succeeds in beating artisanal projects like Assetto Corsa or Project CARS at their own game—but it is a further improvement on an hugely gratifying drive. It's less twitchy than Grid 2, with a forgiving slip angle that lets you wrestle a drifting car back from the edge of disaster (handy if you're out of Flashbacks and can no longer screw with the space-time continuum) and gives great feedback that lets you feel where the car's weight it at all times. You're getting the picture by now: Autosport is the best bits of Grid 1 & 2, distilled into a focussed and finely tuned racer capable of delivering joy on the track. There isn't much going on off it, and though the EGO engine looks prettier than ever there's no hiding the crows' feet and frown lines that come with its advancing age of—er, about six years. The more easily distracted, impulsive racing games fan in you will occasionally lament the game's familiarity; the growing sense that you're playing Race Driver Grid: Remastered, and it's unfair to shout that voice down completely. But in the heat of the moment in any of the game's disciplines, these misgivings melt away and only the exhilaration of scraping past a Ravenwest on the final corner remains.